The feature that sets this cookie sheet apart from the competition is the plastic lid that fits securely onto the sheet. Not only will you use that lid when you’re prepping baked goods in advance and storing in the refrigerator before baking, but it’s also great for storing your finished baked goods or for transporting them to parties or potlucks. It’s not just for baked goods, though – you can arrange vegetables and small bowls of dip on a sheet, snap on the lid, and you’re ready to party. The cookie sheet is a standard half-sheet size and is made from pure aluminum. It is lightweight despite its thickness, and will never rust. The reinforced rim makes the pan extra-sturdy and helps prevent warping. This pan is made in the US and should be hand washed. Made from aluminized steel with a light-colored nonstick coating, your cookies won’t stick or over-brown on this pan. The double-layered coating is reinforced with ceramic for durability and scratch resistance. It resists staining and keeps the steel from corroding, while the micro-textured pattern minimizes surface contact while maximizing airflow for even baking and easy cookie release. The square-rolled edges look modern and add strength to the pan so it resists warping, while the edge also provides a secure grip for easy removal from the oven. The pan is dishwasher safe, but hand washing is a snap because of the coating. After you fall in love with this pan, you can buy more pieces of bakeware with the same features for a complete set. Every piece has dimension markings, so you’ll know that you’ve got the right size pan for your recipe. This aluminized steel half-sheet pan has a dark nonstick coating and a unique corrugated surface that maximizes airflow under your foods for even cooking and easy food release. The coating is stain resistant and helps distribute heat evenly for a brown, crisp food. The rippled surface, which resembles a waving flag, adds strength to the pan, while the rolled edges help prevent warping. The pan is made in the US and includes up to 65 percent recycled steel, so it’s good for the environment. The pan is dishwasher safe, but hand washing is recommended. When storage space is tight, or you want to transport baked goods in their pans, disposable aluminum pans make a whole lot of sense. No need to worry about someone gouging your favorite baking sheet with a knife or scratching it when cleaning it for you. Just take disposable pans to the party and leave them behind. Not just for baking, you can use these for transporting your vegetable platter, cheese tray, or holiday cookies. Need a lid? Just turn another tray upside down to serve as a lid, and secure with clips or large rubber bands. These are sturdy enough for lightweight baked goods like cookies or dinner rolls, but if you’re baking heavier foods like roast vegetables, you can double up the pans to hold more weight and make them more sturdy. While these can be re-used if you’re feeling frugal, they are designed to be disposable, or you can recycle them. While the half-sheet pan is the most commonly used baking pan for home ovens, three-quarter sheet pans will fit many ovens, and they can hold a whole lot more. This pan is made from commercial grade 20-gauge aluminum, so it’s sturdy while still not overly heavy. It’s great for large batches of cookies or dinner rolls, or for roasting vegetables for a crowd. The size also makes this very useful as a serving platter for buffets. The rim is one mm thick and wire-reinforced, so the pan won’t warp or bend in normal use. The pan is built to restaurant standards, so it’s safe for oven, refrigerator, or freezer. This should be hand washed. Baking sheets can be pretty boring, but not if they have a speckled color pattern, like this pan that’s inspired by vintage graniteware. 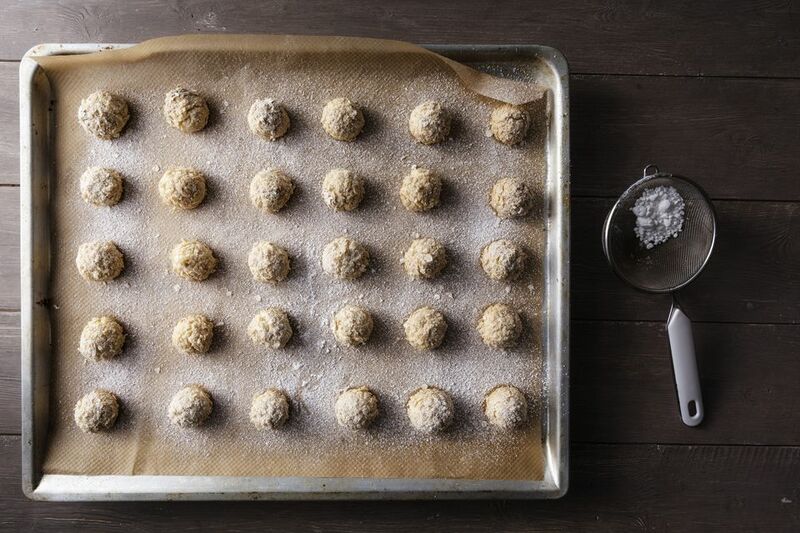 The pan is made from steel with a super-slippery nonstick coating that cookies won’t stick to. Rolled rims keep the pan from warping and wide handles let you grab the pan securely. Because this pan is so attractive (and it’s available in several colors), it’s a lovely serving platter for sliced meats and cheeses, for appetizers, or for desserts. This pan is oven-safe to 450 degrees, so you won’t want to use it for super-high-heat baking, but that’s more than enough for cookies, dinner rolls, and most other recipes. Hand washing is recommended. This insulated cookie sheet is made from two layers of heavy duty carbon steel that resists warping. Between the layers is an air pocket that helps promote even baking all across the pan. This pan doesn’t have the usual sides or rolled edges. Instead, there is one raised edge to help you grasp the sheet to put it into the oven and take it out, while the other three edges are rimless. This means it’s got a second use as a pizza peel to slide your pizza onto the baking stone in your oven and to retrieve it when you’re done. You can also use that rimless feature to slide cookies or other baked goods right off the sheet and onto a cooling rack, without having to lift over the rim. The nonstick coating helps cookies release easily and makes cleanup a snap. It is oven safe to 450 degrees, so you won’t be using it for your highest-heat cooking, but it’s more than adequate for all of your cookies, dinner rolls, and other baked goods. Bigger isn’t always better. It’s nice to have a pair of quarter-sheet pans on hand for baking smaller batches or for keeping foods separated in the oven. Bake cookies on one pan while vegetables roast on another, with plenty of airflow all around. These are made from 16-gauge uncoated aluminum with a wire-reinforced beaded rim, so they won’t bend or warp, and can hold a lot of weight for their size. The tapered rims mean you can stack these neatly when not in use. They should be washed by hand. Stainless steel cookie sheets are more versatile and durable than either aluminum or steel. Aluminum cookie sheets shouldn’t be used for acidic foods, and steel sheets can rust if the coating wears or scratches. Just like your stainless steel cookware, these sheets won’t rust, stain, oxidize, or pit, even if you use them for roasting tomatoes or using lemon juice as a marinade on your chicken wings. They’re dishwasher safe, and won’t be ruined if you get aggressive with scrubbing off burned bits. The sheets have rolled edges that prevent warping, and the mirror finish helps prevent sticking. The set includes both a half-sheet and a quarter-sheet pan, so you’ll always have the pan you need.